Should you wish to cancel your appointment please contact us a minimum of 24 hours prior to your appointment. If failure to do so you will be charged 50% of your treatment cost. Relax and unwind in our spa like environment whilst our Retreat Rooms therapists ensure you have a perfect pamper day to remember. 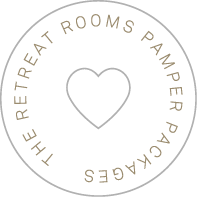 A day of pampering at The Retreat Rooms is perfect for: Baby Showers, Hen Parties or a good girlie get together. All pamper packages are tailored to your individual needs. Prices available upon request.